Pitmaster Rodney Kesee cures his own saltpork in the smokehouse behind the restaurant. 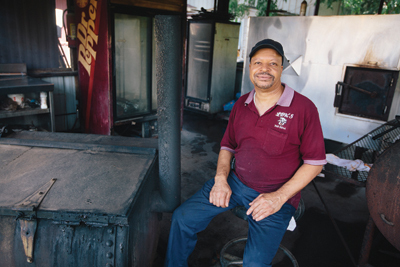 A hundred miles due east of Mooringsport, in Farmerville, LBK’s Barbecue and Soul Food has been serving up barbecue plate lunches and crowd-pleasing soul food since 1994. Overseen by pitmaster Rodney Kesee (the restaurant is named for Kesee’s mother, Latney Beatrice Kesee), LBK’s is an uncommon hybrid of wood-fired barbecue joint and soul food cafeteria. LBK’s serves lunch only, 11 a.m.-2 p.m., Sunday through Friday. Kesee cures his own saltpork in the smokehouse behind the restaurant, and that saltpork lends a country umami – a rich, savory depth – to the outstanding vegetable sides at LBK’s, from turnip greens to black-eyed peas. On most days, there are 10 or more sides to choose from, along with a dozen meats. The hickory-smoked pork ribs are exemplary, cooked to tenderness but requiring the slightest of tugs to pull free from the bone. Fried pork chops are enormous, with a satisfyingly crunchy exterior giving way to juicy meat within. A plate lunch at LBK’s, which includes one meat, two sides and a massive cylinder of hot water cornbread, costs only $7.25. If I’d grown up in one of those churches, I’d probably have become a man of the cloth, myself. Greenwood Mooringsport Road, also known as LA 169, winds along the Louisiana-Texas border just west of Shreveport. Eight miles south of Mooringsport, near the remote gravesite of blues legend Huddie “Lead Belly” Ledbetter, stands Longwood General Store. A combination grocery store, restaurant and casino, Longwood General Store is so far off the beaten path that it seems somehow incorrect to call the place a “truck stop.” Truck stops are places where people stop out of convenience, on their way to other places. Patrons at Longwood General Store aren’t headed to other places – the uncommonly good roadside restaurant is their destination. The dining room amounts to nine or 10 tables tucked among aisles of groceries and sundries. Order a beer and it’ll be pulled from the convenience store’s coolers. Order a cocktail (most of which cost about $3) and it’ll be delivered by the bartender from the casino next door. The menu calls to mind old-school seafood and steak places like Jack Dempsey’s in New Orleans. Heavy platters of golden fried shrimp and whole catfish are exceptional, but the restaurant is best known for perfectly prepared, wallet-friendly ribeye steaks. Ribeyes are only served on Thursday, Friday and Saturday nights, when the dining room fills with locals and in-the-know steak lovers from the small towns scattered along LA 169. There are two ways to order a ribeye at Longwood General Store: rubbed with Montreal Steak Seasoning or covered in a red wine and mushroom reduction. Ribeyes range in price from $20.95 (9 ounces) to $53.95 (48 ounces) and are accompanied by a twice-baked potato, a simple side salad and a platter of longhorn and cheddar cheese cubes. As odd as it may seem to make reservations for a table in a grocery store, Longwood manager Levurnia Williams recommends reservations on weekends.